You guessed it. Infinitive phrases include infinitives. So, what is an infinitive? It's a "to + verb" construct. When "to" is attached to a verb in this manner, it's no longer working as a preposition. Rather, it becomes part of the verb. Examples include, "to walk," "to read," or "to eat." Infinitives can act as nouns, adjectives, or adverbs. As a noun, they might act as the subject of the sentence. For example, "To travel is the only thing on her mind." As an adjective, they'll modify a noun. For example, "ShuYi always brings a book to read." As an adverb, they'll modify verbs, other adjectives, or other adverbs. For example, "Katherine braved the windstorm to search for her lost dog." With a firm grasp on infinitives and their "to + verb" constructions, let's explore the world of infinitive phrases. As a noun, an infinitive phrase will either appear as the subject of the sentence or the direct object. 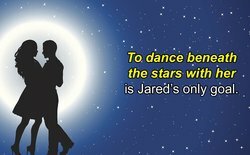 To dance beneath the stars with her is Jared's only goal. Let's break that down. What is the sentence about? It's about dancing beneath the stars with her. "To dance beneath the stars with her" operates as a noun and serves as the subject of the sentence. Then, we're met with the linking verb "is." "Is" is one of the most popular linking verbs. That is, it's not showing action. Rather, it's linking the subject to further information, found in the subject complement. In this case, the subject complement, or that added bit of information, is "Jared's only goal." What about dancing beneath the stars? It's Jared's only goal. Collum likes to meditate after a stressful day. In this example, "to meditate after a stressful day" is the direct object of the action verb "likes." The subject, or the person we're talking about, is Collum. The verb is "likes." What does Collum like? To meditate after a stressful day. The direct object answers the "what" of the action verb. In this example, the subject, or the thing being discussed, is a book. We learn more about the book, or it gets modified, by the phrase "to help you understand fairy tales." Now, we know it's not just a book. It's a book that details fairy tales. Marie walked to breathe in some fresh air. Infinitives are great additives to our everyday language. Given their ability to take on the role of nouns, adjectives, or adverbs, they can modify nearly every part of speech. How are you feeling about all this? Pretty confident, right? Not everyone can define an infinitive phrase off the top of their head. But, now, you can! Double check the rest of your grammar skills and see if you're already familiar with these five grammar hacks that will improve your grammar. "Infinitive Phrases." YourDictionary, n.d. Web. 24 April 2019. <https://grammar.yourdictionary.com/grammar/sentences/infinitive-phrases.html>. You guessed it. Infinitive phrases include infinitives. So, what is an infinitive? It’s a "to + verb" construct. When “to” is attached to a verb in this manner, it’s no longer working as a preposition. Rather, it becomes part of the verb. Examples include, “to walk,” “to read,” or “to eat.” Infinitives can act as nouns, adjectives, or adverbs.As a noun, they might act as the subject of the sentence. For example, “To travel is the only thing on her mind.” As an adjective, they’ll modify a noun. For example, “ShuYi always brings a book to read.” As an adverb, they’ll modify verbs, other adjectives, or other adverbs. For example, “Katherine braved the windstorm to search for her lost dog.”With a firm grasp on infinitives and their "to + verb" constructions, let’s explore the world of infinitive phrases.